With the weather finally starting to turn around here in Atlanta, I decided this was the perfect board to post. I was immediately intrigued with the top photo and wanted to create a wedding inspired by it. 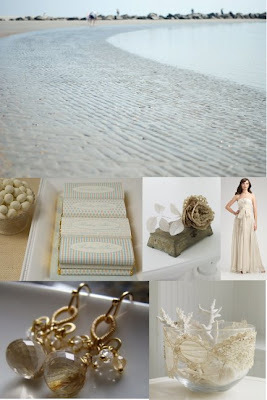 A wedding that captured the colors of the beach in the morning; grayish misty blues, the whites of bleached shells on the beach, the creams of the sand and of course the various golds created by reflected sunlight on the water. Hope you enjoy!